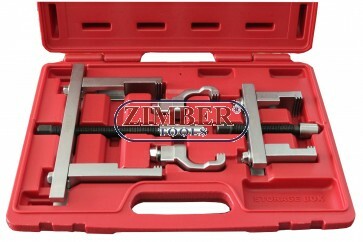 Universal Pulley Puller Set, ZR-36UPPS- ZIMBER TOOLS. For pulling and installing of belt pulleys at power steering pumps, generators, fan wheels, etc. 2 cross beams: 140 mm and 230 mm long. 2 pairs of straight pullers: length 60 mm and 110 mm. 1 pair of specifically formed pullers: length 60 mm. All pullers and cross beams can be combined.